Take the time and cost out of weight loss with these expert-backed products. Haven't started that workout routine yet? Cost and convenience are two of the most popular excuses people fall back on to explain their lack of exercise. And we get it: Pricey gym memberships and boutique fitness classes — and the extra time it takes to trek there — can be enough to dissuade even the most committed among us from squeezing in fitness as often as we’d like. But with the first (and arguably most fitness-focused) month of the year now half way over, now’s the time to get serious about making exercise a more frequent appearance in your daily routine. And luckily for those of us groaning at the thought of trekking through the snow to spin class, fitness doesn’t have to be expensive, time consuming or even require you to leave the comfort of your home. By ordering a few select tools to your doorstep, you can create a super-affordable and effective in-home gym that will give you a total-body workout and have you well on your way to shaping up for warmer weather. Here are the top picks of fitness professionals for equipment that will give you the biggest bang for (not very much) buck. “This is possibly one of the only late-night infomercial products that actually works!” says Bott. “The best part is that it's super adjustable to any level. The ab roller really targets and challenges the front side of your core.” If you’re a beginner, Bott recommends not rolling all the way out. Instead, set up near a wall and roll out until you hit it. Then, as you get stronger, continue to gradually move further away from the wall to increase the difficulty. “Stretching and mobility work is often one of the most neglected parts of training. But if you want to get results you have to train hard, and if you want to train hard, your body has to be able to move easily with a good range of motion to perform the exercises we want,” says Bott. The stretch strap allows you to go a little deeper into the stretch position and take your flexibility to the next level. If you’re up for the in-home workout, but not quite sure what exactly to do, flashcards can be a fun way to get re-acquainted with popular exercises — and can also be a great way to get other family members or friends involved. The only drawback, says Bott, is possible boredom once you’ve worked through the deck a few times. After you’re acquainted with the exercises, up the intensity by seeing how many you can get through in a certain time frame, or get creative and design your own quick morning workouts by arranging the cards in a different order each day. You can also get decks made up of stretching and dumbbell exercises. Once you build up enough strength, you will need to graduate to heavier weights, but the bands do offer a unique training advantage over dumbbells, says Bott. “It makes the exercise harder towards the end of the movement, which can challenge the muscle even more,” he says. “Traditionally with dumbbells the weight is the same throughout the movement, but as the band stretches even further, it's actually increasing the amount of resistance you are experiencing.” You can also get resistance bands with handles attached to more comfortably perform upper body exercises like bicep curls and tricep kickbacks. You can use a foam roller to warm the body up before a workout or to cool down and recover after a workout, which will help prevent stiff, tight muscles the next day, says Walker. “The foam roller can be used on just about any muscle group, although it works best on the large muscle groups like the quads and hamstrings, the buttocks and calves, and the chest, shoulders and lats,” he adds. 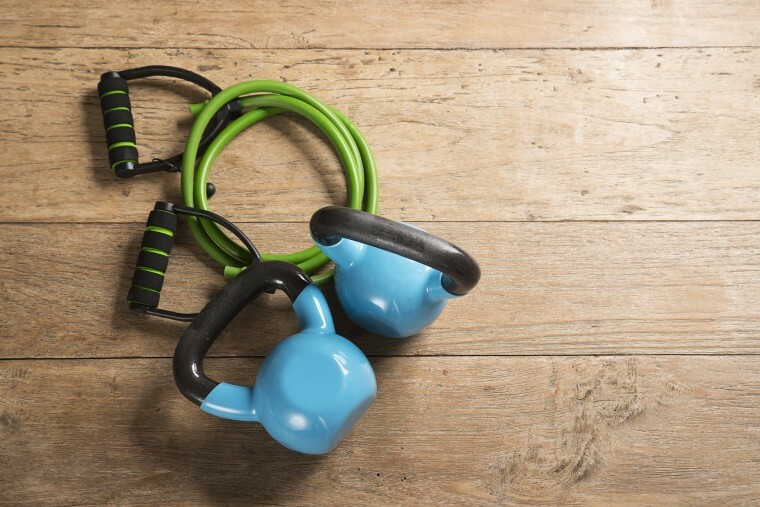 Some things never go out of style, and when it comes to gym equipment, the jump rope is one of them. No, the TRX Suspension trainer doesn't fall under the $20 mark, but if you're willing to splurge on a piece of equipment that will really take your workouts to the next level, this is it. You've likely seen these straps hanging around your gym, and one of their big selling points is the ability to take them in house (or outdoors, or on the road) due to their portability. "The TRX is one of the best bang for your buck pieces of equipment for your home gym and even travel. It hooks up easily and can even be mounted in a doorway if needed at home or on the road," says Bott. And the equipment is a good investment for beginners and more advanced fitness enthusiasts alike. "One of the best benefits of the TRX is that it makes modifying an exercise extremely easy. Whether you are a beginner or an advanced trainee, the TRX allows you to be in control of how hard you are working," says Bott. "Take a squat or lunge, for example. For some beginners, their bodyweight might be too much in the beginning. By holding on to the TRX they can provide themselves the stability and support needed to perform the movement at their level. When performing a movement like a standing row, the further you move your feet underneath the more difficult the exercise becomes, so you can find just the right challenge for you." Just how much of a challenge, you ask? A study published in the journal Human Movement Science found that doing a suspended pushup using TRX bands activated the abdominals 184 percent more than doing a standard pushup — you'll definitely be getting your money's worth. What is the most effective cardio machine in the gym?